After Brad Richards signed with the Rangers over the summer — back when a top line of Richards, Marian Gaborik, and Left-Winger X seemed only natural — fans were able to daydream about a dangerous first offensive unit with two big-money players that could take over games. It didn't quite work out like that: The two spent much of the season on separate lines, with Gaborik excelling on the top unit, but with different linemates. But last night, with Gaborik and Richards joined by Carl Hagelin in the role of Left-Winger X, the Rangers' top line was spectacular in a 4-2 win over Carolina. The line accounted for all four goals in the victory, and they were as impressive as any line's been all season. Richards, especially, has stepped up his game in recent days, tallying four goals and two assists over the last two games. (Needless to say, this would be an excellent time for Richards to get hot and stay hot.) It's a line with skill and speed, one that can forecheck and bury its chances. And so the Rangers have started their seven-game homestand exactly how they were supposed to, with wins over the last-place Islanders and last-place Hurricanes. Health is still a concern though: Ryan Callahan and Michael Del Zotto are out with injuries, and Henrik Lundqvist missed last night's game with the flu. (This seems like a good place to mention that Martin Biron had a strong game last night.) We can talk all we want about putting together a productive top line, but with the playoffs approaching, it's vital that this team gets healthy. 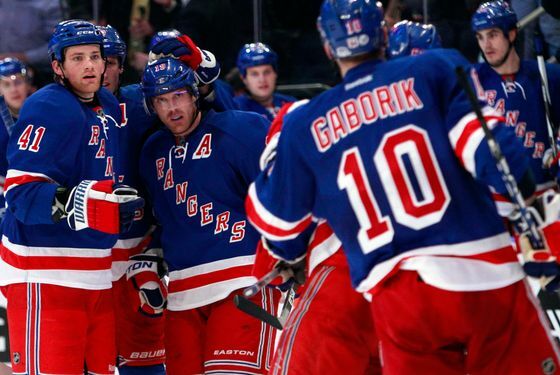 The win, by the way, gives the Rangers a six-point lead over Pittsburgh, who now has a game in hand. And those surging Penguins — along with their captain, Sidney Crosby — will be in town on Thursday, in a matchup of the two best teams in the Eastern Conference. We can't wait.